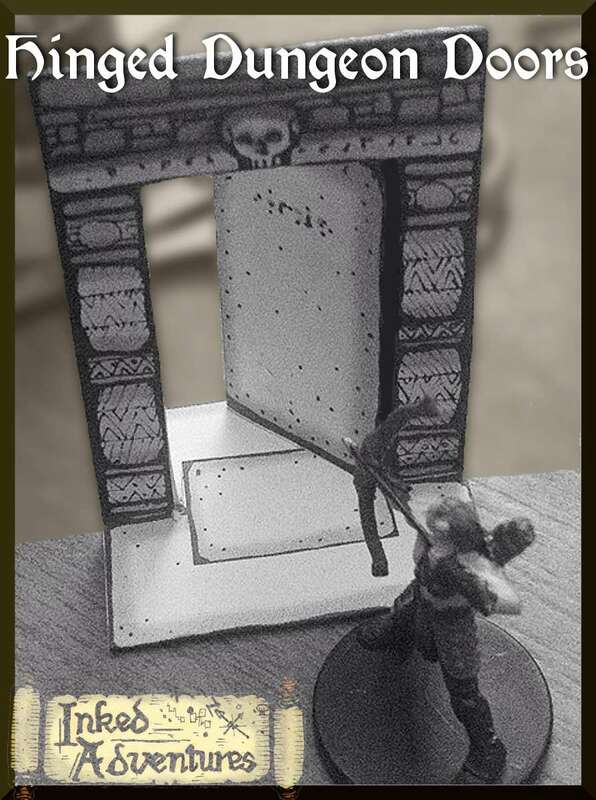 Hand drawn free-standing door frames with swinging doors for your fantasy gaming dungeon. These designs can accompany mats or dungeon floor plans which use the 1 inch = 5 feet scale for 25/17/30 mm tabletop miniatures. The aperture is 2 inches wide for double doors and 1 inch for single doors. The height of the door frame model is approximately 2 1/2 inches tall. Both the doors and door frames are double sided. The doors can be opened and closed during play. The PDFs are intended for printing to thin card or paper (i.e. foldable media), assembled with scissors and glue. Instructions are provided. 4. Curved (arched top) wooden, single. * Can be used in double and single door frames. Before printing the document it is recommended that you choose which designs and themes you would prefer to use and whether or not multiples of pages are required. Printing the whole document will provide 15 doorways (6 double and 9 single door frames) and many spare doors. The designs print well in greyscale if colour ink is low or unavailable. Please note: the PDFs do not use layers, so that they can be viewed in non-Adobe PDF software and cross-platorm browsers. This product is a home-printable product in the traditional sense and not intended for use with VTT or map editing software (please do not leave reviews which berate the lack of editable graphics files). Please read description carefully before purchase. Welcome to the illustrated dungeon!